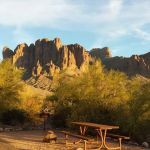 Ask fellow campers about "Lost Dutchman State Park" and nearby attractions. Great winter stay for us we stayed in the non-electric and water area for 14 days. Restrooms were very clean and kept up. Park is quiet, with the exception of occasional Helicopter training/rescue that lands in the park. In 14 days, we saw 3 landings, very noisy when this happens. Park seems more crowded than in past years, also some construction along trailhead and road caused campers to walk in road, but overall a good stay and we would stay again. We camped at Lost Dutchman State Park in a Travel Trailer. T-Mobile cellular and data were available but intermittent as it seemed we were just on the fringe of coverage, but putting our phones up higher in camper using teather mode, we were able to connect ok. This is probably my favorite campground in Arizona, in the foothills of the awesome Superstition Mountains. There are good, paved interior roads; spacious, mostly level, paved sites; with impressive mountain and desert views. Campground is clean and well-maintained. There are easy hiking trails within the Park, and trails up into the Superstitions for the more adventurous. Shopping, restaurants, etc. 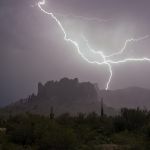 are only about 5 miles away, in Apache Junction. The campground was full the whole time we were there, with quite a few in overflow. I'd recommend a reservation well in advance, at least in the Winter. The only negative I saw is a shortage of restroom/shower facilities - only two buildings for 130-plus campsites. If you're not self-contained, this could be a problem. We would definitely stay here again. We camped at Lost Dutchman State Park in a Fifth Wheel. Absolutely breath taking! Had an absolutely amazing experience and wonderful staff! Very friendly! I just wish there was full hookup, but they do have a dump station! Has clean restrooms and showers. Sites are sunny and open, and the surface is asphalt with a fire ring and picnic table. Site 92 was a very nice with amazing views. Was able to walk out our door to a trail head! 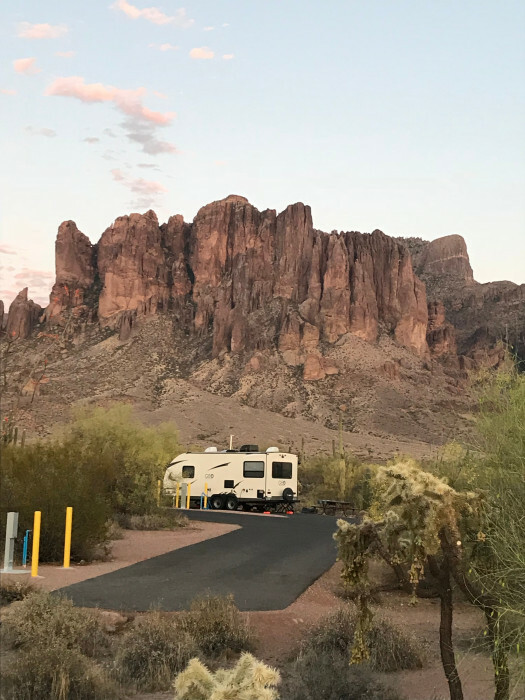 We camped at Lost Dutchman State Park in a Fifth Wheel. This is a very nice and very clean campground. we stayed in site 48 and had a huge site! it was very nicely outlined with rocks in a clover shape and raked clean. there is a nice picnic table an fire ring. the asphalt pad was level and had plenty of room for out trailer and truck, with room to spare. The pads are spaced far apart and the natural brush, trees and cacti provided privacy. the views of Superstition mountains and the incredible sunsets were spectacular. The water pressure was excellent, as was the power. (small gripe; both 50a and 30a receptacles were somewhat loose, no heat problems though) the dump station was clean with dual lanes, and had rinse water and potable water available. There are nice easy trails throughout , great for walking the dogs, who enjoyed all the new smells... Overall, this is a very nice park and we will return. We camped at Lost Dutchman State Park in a Travel Trailer. a five minute drive to Goldfield ghost town, a fun touristy place with stuff to see, eat and do. halfway there is Mammoth Mine Gift and Rock Shop, which, if you like rocks and dinosaur fossils, is one of the nicest shops we have been in. Clean, well organized and filled with quality fossils, unique gems and petrified wood artifacts. The owner is super friendly and knowledgeable. They also have horses for rent if you fancy a ride. The park has spacious sites and clean bathrooms, but no one has cleaned the showers in days. First shower had a dirty diaper and a mess of hair, second and third were garbage free, but not clean. The forth one had a bloody band-aid on the floor and garbage on the bench. Too bad because it's a great location. 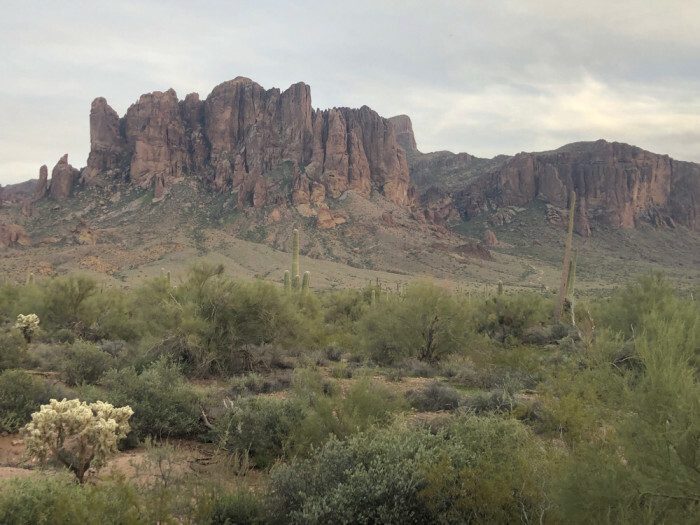 We camped at Lost Dutchman State Park in a Truck Camper. Stayed at Lost Dutchman as we visited family in the area. Because of the extreme danger of wildfire there was a ban on any outdoor fires. Daytime temperatures were in the 100 degree range each day but the nights cooled off enough to have the windows open to enjoy the fresh air. Area was well maintained and employee's were very helpful. Stayed in site 100 which is in the first loop and is a moderate walk to the restroom/shower. We camped in a 22 foot travel trailer We camped at Lost Dutchman State Park in a Travel Trailer. This is a really nice state park campground. The staff is very nice, the interior roads are wide enough for easy navigation, sites are pretty level and good size. 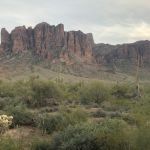 There are hiking trails that lead to the boundary with the Superstition Mountain wilderness and also a fairly moderate and fun MTB trail around the perimeter of the campground. Waking up with the sun behind the Flatiron is a real treat. We camped at Lost Dutchman State Park in a Fifth Wheel. Go hiking in the Superstition Wilderness. As all AZ parks, this one was spotless. The crews keep the sites clean and raked. You could tell they cared. Second time we stayed here and it is great for visiting family. Water and electric is all we needed and both worked well. Gift shop is good for small items. We camped at Lost Dutchman State Park in a Motorhome. Goldfield Mining camp is just down the road and worth a visit. Zipline, mine tour, food, street gunfight, and much shopping and tourist items. We liked that it was not real crowded but had many visitors at the time. Lost Dutchman museum is also worth a stop but not as good. The church is a memorial to the western movies and Elvis. I gave this park a higher rating that I should have but the downfall was our fault. We did not reserve a site!! Access to the park is paved all the way. Our GPS tried to take us down a dirt road. Don't follow the GPS. Stay on highway 88. Check in was quick, efficient and informative. We were placed in the Overflow section for one night (site 118) with no services (same price as everyone else). I could not walk on the left side of my unit with slide out because their was a steep bank that dropped down about four feet. The site was a paved island with a gravel patio area with a metal table and a fire pit. No shade as it is located in the desert. It was very basic but we were happy to get the spot. The second night we were asked to move over to the Group Camp site. This, in our opinion, is much nicer than the overflow (still no services). We had a double wide site, level, with a covered picnic shelter to use and the washroom/shower traffic was pretty much just us. The view was nicer as well. There are no restaurants or services within walking distance. We paid $30.00 per night and feel we received good value. We would return but with a reservation. We camped at Lost Dutchman State Park in a Motorhome. The park has spectacular views of the Superstition Mountains pretty much from most of the sites. The check-in process was the most efficient that I have seen as the volunteer and staff were plentiful and available! We stayed in the "newer loop" where the sites are a little closer to each other but we still had enough space to have privacy. This section had some fairly level sites. We had to switch to one that required blocks under our front wheels but no big deal. Bring your camera for the views and wildlife. We saw Cardinal birds, Hawks, rabbits, quail and other animals from our site which was a treat! Verizon coverage was good. We camped at Lost Dutchman State Park in a Motorhome. Visit Goldfield mine if you like to see Western shows and especially if you have children. The Lost Dutchman Museum had some better Indian, mining and local artifacts that we have seen closeup. They also have a nice gift shop. The Apache Trail drive is worth the time to see the historic town of Tortilla Flats, Canyon Lake and beautiful scenery. Stores and restaurants are a short distance from the park. This is a beautiful park with good trails and very nice camping facilities. Our space (16) was large and level; the restrooms were cleaned at least once or twice per day and were always in good shape. The showers were individual, with an outside lock on each. The power and water worked well. We camped at Lost Dutchman State Park in a Travel Trailer. There is a good grocery (Fry's) about 5 miles away in Apache Junction. The campground firewood was excellent- no need to go elsewhere for firewood. We have been coming to this park for thirty years. Have always loved it and considered the facilities as basic but clean. This visit we have seen a huge drop in the cleanliness of the bathrooms and especially the showers. This trip so far (12 days) and the showers have the same hair, cobwebs and desbris. It is amazing as this park has 26 hosts and abundant Rangers also. Possibly because so many people that everyone thinks someone else will do the cleaning. We love the Arizona State Parks but there is something wrong here. Other AZ State Parks are very clean and everything gets done with far fewer hosts. We will come back but advice to everyone is to complain and also maybe shower and use the facilities inside your RV until things improve here. 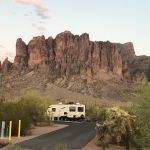 We camped at Lost Dutchman State Park in a Fifth Wheel. Brand New Fry's Grocery Store is wonderful! Another really nice state park in Arizona, I can't think of any reason to give less than the max stars. We checked in just before noon and didn't have any issues at all like the previous poster mentioned. Our pull through site had 3 steps that led up to a large yard area with a picnic table, fire ring and grill. The hookups are on the inside of the site, so if you want to park so that your door faces the mountain, you'll need to run the electric and water under your rig, like we did. But that wasn't an issue. We had such an incredible view. And there are so many trees and bushes surrounding the site, it was very private. We'll definitely be coming back here. We camped at Lost Dutchman State Park in a Travel Trailer. Goldfield ghost town is very close by and you can hear the gunfights at night. We also heard coyotes every night and sometimes in the morning. We 'were' regulars and have enjoyed this park quite a bit over the years. There is a new manager there that has decided to get rid of many waste receptacles as well as some other head scratching changes. Not for the better from what we can tell. We were told that another new rule is no checking in before check in time, even if your site is empty from the night before. We challenged that rule with the corporate office after being forced to turn our huge rig around a very tight spot after being denied check in...to an empty, clean site. Further we were told to go park in a local business parking lot to wait till check in time. The business was not pleased. I do believe they got things straightened out after corporate got involved. The next morning people were checking in as early as 9AM. Hopefully the new manager will not totally spoil the park. Fingers crossed, but so far it is discouraging. We camped at Lost Dutchman State Park in a Fifth Wheel. This park was the most cost effective in the area even tho further out from the city. Hiking is about the only activity we did and it was too warm to do much. We camped at Lost Dutchman State Park in a Motorhome. There are a couple tourist type attractions nearby but we did not do them. They did look like fun. If there is rain be sure to watch for flash floods. We had a flood the last morning and had 30 foot wide by 1 foot deep all around the motorhome. Drainage was good and complete once the rain stopped. Town is nearby for stores and gas. Many trails to choose from for daily walks/hikes. Campground Hosts very hospitable and accomodating. Apache Junction is approximately 4-5 miles away and provides ample shopping and restaurants. We did the moonlight ranger hike (held at full moon) - what fun and very informative. Make sure you drive the Apache Trail while in the area--very scenic and relaxing. 5miles to Apache Junction. Close to Mining Csmp Restaurant, with live entertainment several nights a week. Close to a museum and a touristy mining town. The campground is located in a very nice state park with good trails, some scheduled programming. Folks in campground office are very helpful with tips for things to do. Superstition Mountains are an awesome sight. Night sky is dark enough toward east for casual stargazing, lights of Phoenix drown out the west. The ghost town nearby was disappointing. To me, it felt like a western-style strip mall, designed to separate you from your money. It may be of value to families with yung'uns if you have the $ to spend on rides and attractions (train ride, zip line, mine tour, "mystery shack", which were all about $7 each). There was a cute gun-fight staged in the center of town. There was no entry fee and parking was free, so it was a nice stroll on a beautiful day. Otherwise, meh. A drive up 88 through Tortilla Flat (we didn't stop, seemed like a tourist trap) to Roosevelt lake is a must. You can now make reservations up to a year in advance. Feb-April is the busiest time. You definitely need to make a reservation even with a tent for the peak period. Bathrooms can be a far walk. On weekends there can be a long wait at the dump. We dumped the night before we left. The Good Apple Market in Apache Junction is a health-food store with incredibly low prices on produce and supplements, and only about 5 miles from Lost Dutchman. The Superstition Mountain Museum, about a mile from the park, is a wonderful little museum and a great value for $5. Be wary of the new loop (sites 75-104) if you're in a bigger rig. Many are not suitable despite being described as very long on the reservation website; they may be very acute U-type pull-throughs, or be at such a sharp angle to the (quite narrow) road as to be impossible to back into. Site #93 was such a case for our 40' fifth-wheel with long-bed dually combination..
Are you affiliated with Lost Dutchman State Park ?